Included in this extraordinary volume are the poems of 43 of America's most talented African American wordsmiths, including Pulitzer Prize-winning poets Rita Dove, Natasha Tretheway, Yusef Komunyakaa, and Tracy K. Smith, as well as the work of other luminaries such as Elizabeth Alexander, Ishmael Reed, and Sonia Sanchez. Included are poems such as "No Wound of Exit" by Patricia Smith, "We Are Not Responsible" by Harryette Mullen, and "Poem for My Father" by Quincy Troupe. Each is accompanied by a photograph of the poet along with a first-person biography. The anthology also contains personal essays on race such as "The Talk" by Jeannine Amber and works by Harry Belafonte, Amiri Baraka, and The Reverend Dr. William Barber II, architect of the Moral Mondays movement, as well as images and iconic political posters of the Black Lives Matter movement, Malcolm X, and the Black Panther Party. 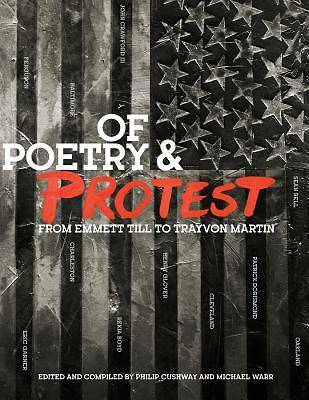 Taken together, Of Poetry and Protest gives voice to the current conversation about race in America while also providing historical and cultural context. It serves as an excellent introduction to African American poetry and is a must-have for every reader committed to social justice and racial harmony.